A little while ago, I decided to make some quesadillas. I’ve done this a handful of times, and I’ve never put a lot of thought into it. I took packaged grated cheese and some baked chicken I had lying around and melted it between two store-bought white flour tortillas. Later, when I ate them with some salsa, it struck me that my quesadillas were really not very good. Unimaginative, at best. How could this be? What is so hard about quesadillas? Thus began my quest for the perfect–or at least better–quesadilla recipe. The actual origins of the quesadilla are unknown, but the native Mesoamericans were making flat corn breads in the early 15th century when the Spanish showed up. The Spanish conquistadors called them “tortillas”. 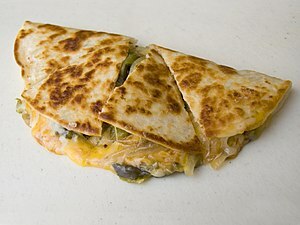 The existence of quesadillas–tortillas filled with cheese and other ingredients–is documented by the 17th century. Popular ingredients in Mexican quesadillas include potato, chorizo sausage, squash blossoms, chopped chile peppers, and huitlachoche (a fungus that grows on corn). My normal recipe uses store-bought wheat flour tortillas, packaged “mexican” cheese, and usually shredded chicken. I’m going to improve on this, starting with the tortillas. Come back tomorrow to find out how to make your own! Next Post Make your own corn tortillas!